A attractive 3/4 length Long Coat in genuine leather, The long sleeves and the fall of the leather compliments the design. The use of soft leather with WASH EFFECTS makes these leather jackets more comfortable, durable and ever stylish. 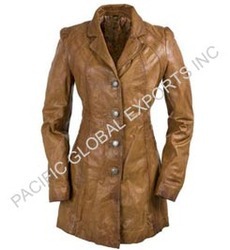 Unbelievable price on Lamb Leather Long Coat in New Delhi (India) company Pacific Global Exports Inc..